SAINTS suffered their third defeat on the trot after a narrow loss to lowly Hull. 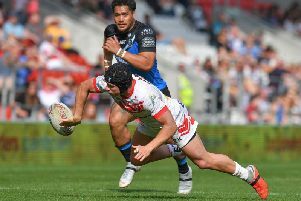 The injury-hit champions - who were in the wars again last week, losing to rivals Wigan - started with two teenage debutants in their three-quarters, and Hull sensed that there were some seams to pick at. Hull took an early lead after forcing a repeat set from a fumbled high kick and then another from offside on the line. That pressure finally told when Joe Westerman and Leon Pryce combined to create the space for Shaul to slip through. Jordan Rankin added the extras to make it 6-0. A Saints penalty from a high tackle put them in a good attacking spot and from there nice work from Lance Hohaia and James Roby sent the supporting Tommy Makinson skipping through. Makinson tagged on the two to level the match. The to-and-fro nature continued and a pair of Hull penalties gave them a great position to have another crack at the line with wing Curtis Naughton just managing to get the ball down despite tackle of Bailey to cut the deficit to 12-10 on 24 minutes. Saints very nearly hit right back with fresh-legged Alex Walmsley believing he had cashed in on a Hull dropped ball with a try, only for the in-goal touch judge to rule a knock on in the build up. Saints made a tactical switch at the break, with youngster Bailey withdrawn and the backline reshuffled. Hull hit the front eight minutes into the second half when former Saint Leon Pryce made a telling intervention, attacking the line and getting the ball down despite the tackle. Rankin’s goal made it 16-12 to the visitors. Saints almost hit back immediately with a great break by Roby carving open the Hull defence, but although that play was foiled on the line they were soon back for more. And from a penalty on 54 minutes Turner, playing against his former club, showed some determination in driving towards the posts. Makinson improved to put Saints 18-16 ahead. Saints did suffer a stroke of bad luck when Adam Swift pieced the Hull left flank and was looking dangerous but then lost the ball. Hull forced an error when Hohaia was adjudged to have knocked on a high Pryce kick. From there the visitors piled on the pressure and that finally told when a floated wide ball sent Fetuli Talanoa over on 66 minutes. Rankin missed the goal but Hull had a two-point lead and looked determined to defend it. A penalty from a high tackle allowed Makinson to level from 30 metres nine minutes from time, but the Saints were hanging on. After a high kick was caught and returned quickly by Swift, Saints were soon back on the front foot, but a fumble by Ashworth on the halfway line turned the ball over. Hull countered ruthlessly with Shaul showing a great turn of pace and nimble footwork to turn Makinson inside out to run in from halfway. Rankin goaled and to compound Saints’ misery the restart kick went out on the full. Hull worked their way down field with Rankin slotting another penalty to make the game safe with three minutes to play.